Tag line: "My name is Bond - James Bond"
Trivia: Deborah Harry, lead singer of Blondie, recorded a theme song for this film that was rejected by the producers. It appears on the 1982 album "The Hunter." Like most James Bond films, 1981’s For Your Eyes Only opens with a pre-credit sequence. And man, is it a doozy! After visiting the grave of his wife, Teresa (who was murdered at the end of 1969’s On Her Majesty’s Secret Service), Bond (Roger Moore) is approached by a Vicar (Fred Bryant), who informs him that MI6 is in desperate need of his services, and is sending a helicopter to pick him up. Unfortunately for Bond, the helicopter actually belongs to his arch-rival, Ernst Blofeld (John Hollis), who is guiding the aircraft via remote control. After toying with 007 for a while, Blofeld tries to finish Bond off by crashing the helicopter, but before he can do so, Bond gains control of it, swoops down, and… well, I won’t spoil it for you. 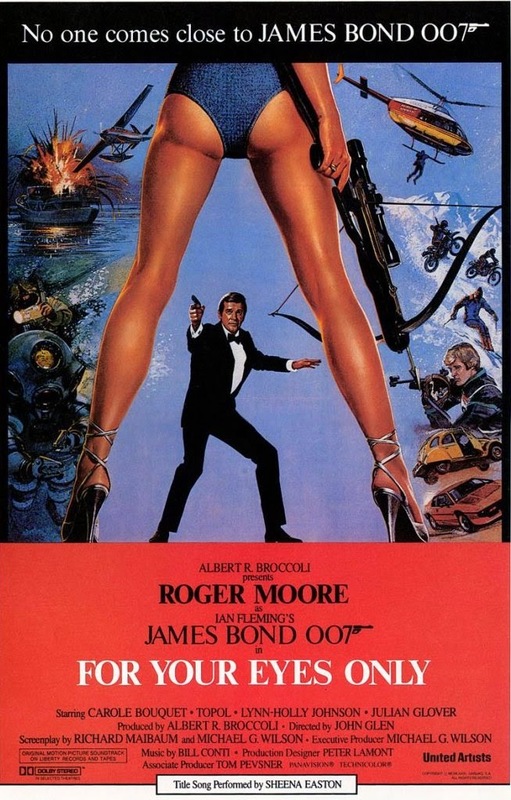 It’s an opening that features plenty of humor (a characteristic it shares with every other Roger Moore-era Bond flick), yet the scene is also memorable because it pays homage to the series’ previous films, setting the stage for a movie that, like some of those earlier entries, takes the emphasis off high-tech gadgetry to instead focus on pulse-pounding action, which For Your Eyes Only has in abundance. While patrolling in the Ionian Sea, Britain’s undercover surveillance ship St. Georges strikes a mine, destroying the vessel and killing everyone on board. What has Sir Frederick Gray (Geoffrey Keen), the UK’s Minister of Defense, so worried is that the St. Georges was equipped with an Automatic Targeting Attack Communicator (ATAC for short), an instrument that coordinates the whereabouts of the country’s nuclear submarines. If the ATAC falls into the wrong hands, it could be used to order the subs to attack Britain itself. In an effort to recover the device, Agent James Bond turns to Greek businessman Aris Kristatos (Julian Glover) for help. A former freedom fighter with connections in the underworld, Kristatos tells Bond a smuggler named Columbo (Topol) is trying to salvage the ATAC so he can sell it to the highest bidder. Aided by the lovely Melina Havelock (Carole Bouquet), who’s seeking revenge for the recent murder of her parents, Bond closes in on Columbo, but is he truly 007’s enemy, or is the real culprit someone else entirely? Unlike Moonraker, where he was looking far too old for the part, Moore is in fine form in For Your Eyes Only, handling both the action and romance with the greatest of ease. Also strong are Julian Glover and Topol as Bond’s allies / adversaries, with the filmmakers keeping us guessing as to which one is which. Then we have Carole Bouquet as Melina, whose beauty is as awe-inspiring as her skills with a crossbow, a talent that makes her a very effective partner for 007. The settings are also exquisite (it was shot on-location in Greece, Italy, and the UK), and Sheena Easton’s excellent title song perfectly complements the movie’s flashy, elegant opening credits sequence. More than anything, though, For Your Eyes Only is wall-to-wall action, with car chases (as well as a few involving motorcycles); a death-defying showdown on a ski slope (perhaps the most exciting scene in the movie); an underwater salvage operation (which leads to a yet another run-in with an enemy agent); and a whole lot of fisticuffs. At one point, Bond even gets to scale a mountain, setting up what I consider to be the film’s most intense sequence. After the disappointing Moonraker, For Your Eyes Only was the shot in the arm the series needed, and for me ranks just below The Spy Who Loved Me and just above Live and Let Die, making it one of the finest of Roger Moore’s Bond outings.